Be the first to review this 2018 Mercedes-Benz E-Class. The 2018 Mercedes-Benz E400 sedan, coupe, wagon and cabriolet are all new, bigger, better looking, and more efficient than the previous versions. They follow the Mercedes-Benz E300 sedan, which was all new for 2017. Longer, lower and wider, these E-Class models are loaded with technology, including semi-autonomous driving features. 2018 E-Class rivals include the Audi A6, BMW 5 Series, Lexus GS, Jaguar XF, Cadillac CTS, Tesla Model S, and even the S-Class. In its lineup of four body styles, the E-Class uses turbocharged engines of four, six and eight cylinders; rear-wheel drive and all-wheel drive, and high-performance AMG models. The cars’ performance characteristics can be changed and tuned to the drivers’ liking with drive modes, adaptive suspensions and tunable steering. This review will be kind of generic, since a hundred iterations of E-Class could be described. Base engine in the E300 is a turbo four making 241 horsepower. The E400 takes a twin-turbo V6 making 329 horsepower, with all-wheel drive. The E-Class sedan runs the board in crash testing with the NHTSA, five stars in every test. The IIHS gives it Top Safety Pick Plus. Every E-Class has forward-collision warnings with automatic emergency braking, LED headlamps, and a sound alert that makes a noise at you when the car thinks you’re not paying attention to the road. In a crash, the seat bolsters tighten. A rearview camera comes standard on 2018 E-Class models. The optional self-driving system is called Drive Pilot, and costs more than $10,000. It can change lanes automatically when the lane is clear and the driver signals for two seconds. It can follow, accelerate, and stop behind other cars in traffic at speed as high as 130 mph. It can follow lanes at speeds up to 81 mph even when the lanes aren’t well marked. The system can squeeze the brakes when oncoming traffic veers into your lane, and it can add force to the steering when the driver makes an evasive maneuver. The rear-wheel drive E300 sedan gets 22 miles per gallon City, 30 Highway, 25 Combined. The all-wheel-drive E400 4MATIC sedan gets 20/27/23 mpg; the coupe and cabriolet get 22 mpg Combined, and the wagon and AMG E43 sedan get 21 mpg Combined. The powerful E63 sedan or wagon with a V8 engine gets 15/22/18 mpg. With so many versions, the price ranges from an entry level for the E300 sedan of less than $54,000, to the AMG E63 S wagon for twice that. Both before any options, which can add greatly to the bottom line. The E300 only comes with the turbo four. The E400 only comes with the turbo six and all-wheel drive with air suspension, in the sedan and wagon. The E400 Coupe and Cabriolet are rear-wheel drive. The E43 sedan gets a more powerful twin-turbo V6, while the E63 sedan and wagon use a twin-turbo V8 and all-wheel drive. Standard equipment on the E300 includes synthetic leather upholstery, Bluetooth with audio streaming, two USB ports, Apple CarPlay, power front seats, power windows/locks/mirrors, automatic climate control, remote start, navigation, ambient lighting, and rearview camera. More options include a head-up display, and active headlamps. 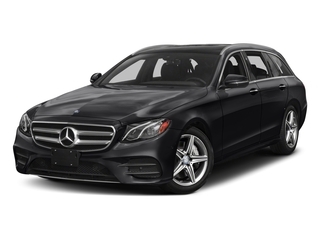 The E300 can also be optioned with big 18-inch AMG wheels, sport suspension, a panoramic roof, 19- or 20-inch wheels, heated and cooled front seats, adaptive headlights, satellite radio, and a set of 12.3-inch digital displays that replace conventional gauges. Standard equipment in the E400 coupe includes keyless ignition, leather upholstery, memory front seats, a panoramic roof, and a rearview camera. Cabriolets add standard rear-seat side airbags and a power folding cloth top, as well as warm-air vents at neck level. Major options on both include an air suspension, and a head-up display. Wagons have a split-fold rear seat, fold-away third-row seats, and a power tailgate. E43 sedans have 19-inch wheels, AMG exterior trim, a sport steering wheel, a stitched dash, and AMG gauges. Mobile apps that record track performance, a panoramic roof, and carbon-fiber trim are among the options. E63 sedans and wagons get Nappa leather, heated and cooled front seats, and a power trunk closer (on sedans). The E63 offers carbon-ceramic brakes and a sport exhaust system. The dash can be dominated by twin high-rez 12.3-inch display screens that replace the gauges and controls, although most E300s will come with one screen and a handsome set of dials and climate switches underneath. In place of a shift lever, there’s a touch-sensitive control puck for the COMAND infotainment interface. It’s a futzy knob. The E300 is receptive to fingertip control, namely in the steering wheel that has touch surfaces for swipe-and-tap operation. Intended or not. Two suspensions are available for the E300. There is a firm multi-link suspension with adaptive dampers in either base or sport (firmer) tune, or an air suspension with adaptive dampers. In addition to that, the wheel sizes range from 17 to 20 inches, mounted with different tires. The E400 makes few compromises. Its 3.0-liter twin-turbo V6 makes 329 horsepower and 354 pound-feet of torque at 1600 rpm, powering it from zero to sixty in 5.5 seconds in the rear-wheel-drive Coupe; in the all-wheel-drive sedan, with better traction from the standing start, it does that sprint in 5.2 seconds. All that torque at such a low engine speed makes the E400 feel even quicker. Unlike the four-cylinder, it feels smooth and refined. Its 9-speed automatic transmission does quick and smooth shifts. The E43 sedan boosts that V6 to 396 horsepower and 384 pound-feet of torque, mated to a stronger 9-speed that shifts like a racecar’s. It does zero to sixty in 4.5 seconds, and 155 miles per hour. The all-wheel drive stretches the front/rear bias to 39/61. The new E400 with its smooth engine, may be the best E-Class. The E43 is a high-performance sedan, while the AMG E63 is pure excess, in a good way.